How to Grow Celery | Grow This! Celery is considered one of the trickiest vegetables to grow by many home gardeners. It can be difficult to transplant, takes a long time to mature, prefers cool temperatures and will not tolerate the heat. What’s more, many have found that home garden celery offers only moderately better taste than that purchased from the store. However, we believe the taste and nutritional value can be well worth it and the challenge of growing celery can be extremely rewarding. If you’re up for it, here are some tips on how to grow celery. If you grow from seed, there will be a large number of cultivars of celery from which to choose. ‘Golden Boy’ and ‘Tango’ are self-blanching varieties, which can cut back some of the work of growing celery. ‘Ventura’ is the most common type, and ‘Redventure’ has red stalks and can be a lot of fun to grow. Check the days to maturity of any variety before planting to ensure you have ample time needed. When in doubt, consult local growers to find out which types of celery thrive in your area. Celery requires cool temperatures. It can be grown as a summer crop in the north or as a winter crop in the south. Temperatures should stay between 55° F and 70° F for the entirety of the growing period, which can last 90 – 120 days. 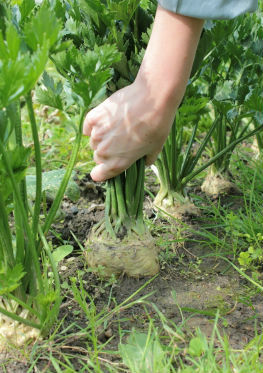 The most common mistake in growing celery is not allowing enough time in the proper conditions for it to fully mature. Try starting celery indoors 10 weeks before the last frost of winter, particularly if you have a shorter growing season. In the south, you can start your crop in the fall as soon as temperatures are cool enough. Celery can be grown anywhere with full sun and where temperatures are consistently between 55° F and 70° F. This may be a summer, fall or winter crop depending on the area. Celery will need shade in the hotter parts of the day, in hotter regions, or if temperatures rise or become too humid. Celery needs extremely fertile, well drained soil with a neutral pH (6.0 – 6.5). Be sure to add lots of organic matter before planting. The best way to ensure a successful celery crop is to plant in rich soil. Soak your celery seeds in warm water for 24 hours before planting. Sow seeds no more than ¼ inch deep and 1 inch apart. Be sure to plant them shallow. Thin to 10 – 12 inches apart once they are about 6 inches tall. If you start your celery in seedling trays, they’ll will need to be moved to individual pots once they reach 2 inches tall. Set transplants into the garden when they are 6 inches tall at about 12 inches apart. Set them at the same depth they sat in their pots. Harden them off by introducing them gradually to the outdoors before planting them into the ground. Celery can be tricky to transplant, so bring them outside during the day only, increasing the amount of time each day for a week before planting them into the ground. Water and mulch immediately after planting. Always transplant into moist soil. Best not to transplant on a hot or sunny day, which can easily dry out the roots. Celery is a heavy drinker and gluttonous feeder. They’ll need at least 1 inch of water per week, but keep an eye on the soil. Keep it moist without letting it get muddy. Use a balanced organic fertilizer or compost tea every 10 days – 2 weeks. Weed very carefully. Celery has shallow roots. Even better to use heavy mulch to fight root competition from weeds. This will also help to keep the soil moist and warm. Blanching can reduce the nutritional profile of your celery but will also keep it tender and sweet. If you haven’t chosen a self-blanching variety you can help it out by gradually building a mound of soil around each plant in the last few weeks before harvest. Add a little more soil each day leaving the leaves exposed. You can also use brown paper or cardboard to cover the lower half of the plant two weeks prior to harvest. Celery can harvest when the desired size of the stalks are reached but you should wait the full amount of time to maturity as listed on the seed packet for your specific variety. This is usually about 120 days. Cut stalks off just below the soil line. Use black or clear plastic mulch should temperatures drop below 55° F at night for any part of the growing season. You must keep temperatures consistent to have a successful celery crop. Keep an eye out for aphids, which can pester and hinder celery growth. For best results and longer preservation, water the day before you harvest. Do you have tips on how to grow celery? Let us know in the comments section below.